SharePoint Custom Development. Done Right. With 1200+ happy clients and 20+ years experience, Imaginet is your trusted, go-to partner for any organization looking for SharePoint Custom Development services that are on time and within budget. Rapid SharePoint Solutions. On Time. Within Budget. Experience first-hand Imaginet's solid reputation for delivering rapid custom SharePoint solutions, eliminating delays and risks associated with typical SharePoint Custom Development projects. Request your free consultation call with us today. Most organizations lack the experience to know how to successfully design and implement a custom SharePoint solution from start to finish. With over 1200+ happy clients and 20+ years experience, Imaginet is your trusted, go-to partner for all of your custom SharePoint development needs. 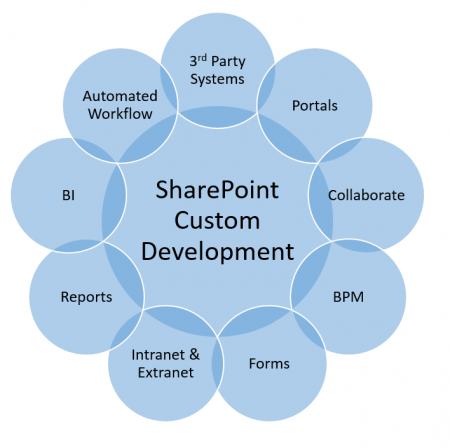 SharePoint Custom Development Services offered worldwide.